I spent about 150 USD for two Chinese courses (Rocket Chinese and Chinesepod). In the next months I may write a review of the courses, but I think this is secondary. What’s important is that I spent the money. This pushed me to “consume” the products I bought, that is to learn Chinese, for avoiding the (in)famous buyer remorse. I publicly committed to study one hour per day on this blog. Together with the fact that I invested some money on the project, the commitment helped me to study (almost) every day. The image below is a screenshot of my Samsung (well, in fact I took a photo of the smartphone). It documents how many minutes I spent on flashcards review in the past six months. As you can see I managed to study 170 days out of 180. 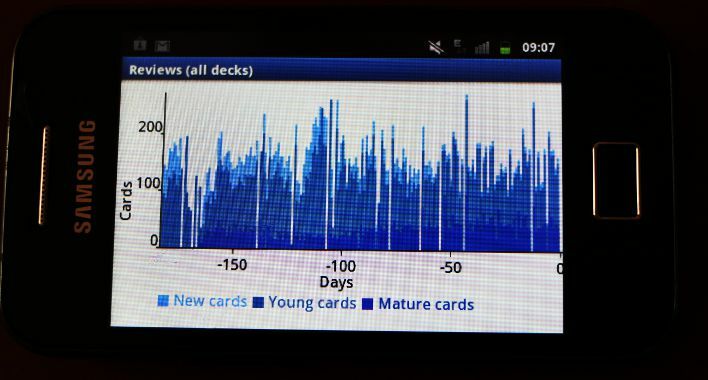 Anki’s screenshot: The time I spent everyday reviewing my flashcards. Using flashcards that feature sentences instead of single Chinese characters. I wrote a whole post to explain the advantages of memorizing characters in a context and I’m still convinced this is the way to go. Let my Internet connection influencing my scheduling. During the first two months of this Chinese challenge I was studying at home, after dinner. And I must say it was great fun. I was studying my Chinese course, reviewing the flashcards from the deck I downloaded, checking the words and the structures I didn’t understand at Nciku (my favorite Mandarin-English dictionary) and Chinese Grammar Wiki. However in April my Internet connection went away and never recovered (ah, the pleasures of living in China). So I couldn’t accede to my Chinese course, my dictionary and my grammar anymore. The result was that for a couple of months I reduced my active study to my daily Anki’s review (listening to the course audios is passive study), which allowed me to learn an impressive number of new words but wasn’t probably the best choice, as I will explain in a moment. I started too late (only at the beginning of August) to build my own deck of flashcards. Instead, I spent too much time reviewing the Mastering Chinese Characters ending up with a 5,000 cards deck where there are too many cards that are still too difficult for me. The result was that my Anki sessions became as boring as hell and the only reason I didn’t give up was that I had previously done a strong commitment. Since I had some previous knowledge of Mandarin, it was logical to start with the Mastering Chinese Characters. I had the possibility to review basic sentences without losing time building my deck. This is the reason I was able to complete 5,000 cards in only six months. However I should have started to build my deck with sentences that matter to me at least two months ago. 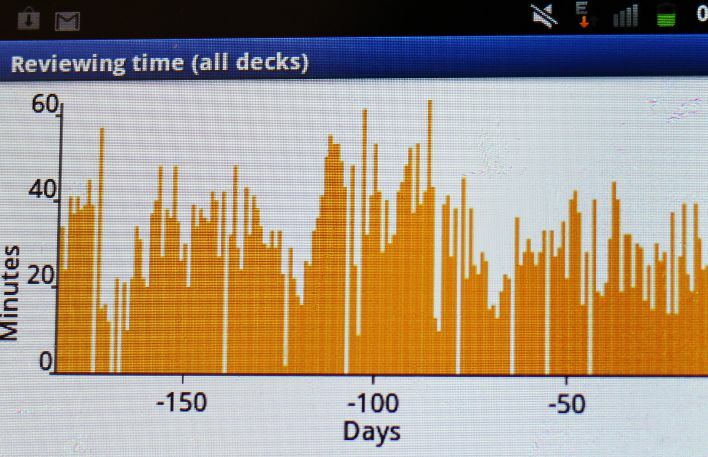 The statistics from my Anki decks. I gave too much importance to Anki. At the beginning I was adding fifty new flashcards every single day. 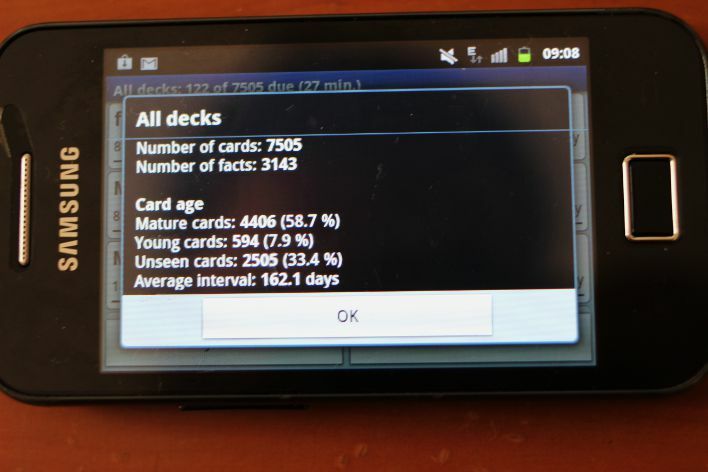 This is a lot of cards to review (I averaged 162 cards per day in these six months even if after three month I slowed down to ten new daily cards). Since I only dedicate one hour per day to the study of Mandarin, there were days that all I did was to review my flashcards. I should have spent less time learning new words and more practicing them in different sentences and contexts to fully master them. Why I say that? Because it’s clear to me that I know way more characters and words than the ones I can effectively use on a conversation. Sure, as long as I keep up with my daily flashcards I don’t forget these words. Also, when I hear them I’m usually able to detect them so my understanding of Chinese is improving. However it’s kind of frustrating to know all these words and never be able to use them. I need to speak more Mandarin. As I just wrote, I know thousands of words but if I don’t use them in a daily basis I will never master them. My problem is that I’m lazy pig and I cannot push myself to speak Chinese unless it’s strictly necessary. If this wasn’t enough, I’m going two months to Italy for Christmas, where I suspect I will not talk Chinese that much. It would be great if I could write: “By tomorrow every time I will talk with a Chinese person I will use Mandarin” and then respect my promise. However this tactics doesn’t really work for me. The only way I can speak Mandarin in a regular way is to have to talk with people that don’t speak English. I will be traveling a lot in the next three months so I hope I will have more opportunities then when I spend all the day at office. I will listen to two new Chinese Pod’s podcast every day and add the sentences I would like to remember to my Anki’s deck in a daily basis. The idea is to build a deck of cards with only sentences that I would use myself. Right now I’m listening to the intermediate level lessons but I plan to move to the upper intermediate level within a month. At the moment I’m learning ten new cards per day from Mastering Chinese Characters vol. four. As I said before, this deck is not longer funny for and I’m really struggling to keep up with the review. I will still add ten new cards per day but hopefully they will be cards that I wrote myself from my Chinese course or my daily experience with Mandarin. Will I achieve my original goal? Even if my Mandarin level skyrocketed since when I started to study, giving the pace I’m progressing I don’t think I will be able to reach all the objectives. This is not a bad news. Here the reason: let’s say in 2010 you didn’t do any sport at all. But in 2011 you set the goal of running a marathon within a year. You trained everyday but at the end you were only able to complete half marathon. Should you be disappointed? I don’t think so. You trained every day (this was the main point of having a goal after all) and, if you keep working hard, you will probably complete your marathon this year. What I’m saying is that, as long as you did your best to achieve them, it’s acceptable to fail your goals. The important is to progress in a steady pace!